“I hope not much to tire those whom I shall not happen to please; and if I am not commended for the beauty of my works, to be at least pardoned for their brevity. But whether my expectations are most fixed on pardon or praise, I think it not necessary to discover; for having accurately weighed the reasons for arrogance and submission, I find them so nearly equiponderant, that my impatience to try the event of my first performance will not suffer me to attend any longer the trepidations of the balance. Can one blog about this article? Throughout the history of public theological debate, there was one constant—those debates only took place between a few select people—Moses, Plato, Augustine, Aquinas, and so on—who gained respect through a lifetime of scholarship. But the invention of social media, like blogs, Twitter, and Facebook, created a radical departure in communication. In pre-2004 Christianity (that is, Christianity before Facebook was invented), only a small group of Christian leaders and teachers had access to the printing press—but today everyone has WordPress. In pre-2004 Christianity it was difficult to become a published author, but today everyone is surrounded by dozens of “Publish” buttons. Every time we log into Facebook it asks us, “What’s on your mind?” Twitter wants to know, “What’s happening?” When controversies large and small erupt, there are devices in every direction begging us to not just take a side, but to declare our position on the largest publishing platform ever constructed by humanity. What few of us realize is that when we press those “Publish,” “Post,” “Comment,” and “Send” buttons, we are making the shift away from merely “believing” truth and stepping into the arena of publishing that belief. In doing so we are effectively assuming a position of leadership and teaching that prior to 2004 was not available to us. James warned us, “Not many of you should presume to be teachers, my brothers, because you know that we who teach will be judged more strictly” (James 3:1, NIV1984). James goes on to graphically portray the incredible power that our tongues have both to praise and to curse especially in the context of teaching. He then says, “Who is wise and understanding among you? Let him show it by his good life.” (James 3:13). Solomon echoes similar wisdom, “Even a fool is thought wise if he keeps silent” (Prov. 17:28). Will Hatfield and others have begun a blog in conjunction with the GARBC young leaders group called The Quest. Looks like it could be a good venue for dialogue. Check it out. A particularly fitting picture for 10,000 site hit. Proof that you to can start a blog that only you and your sister read and get to 10,000 hits. 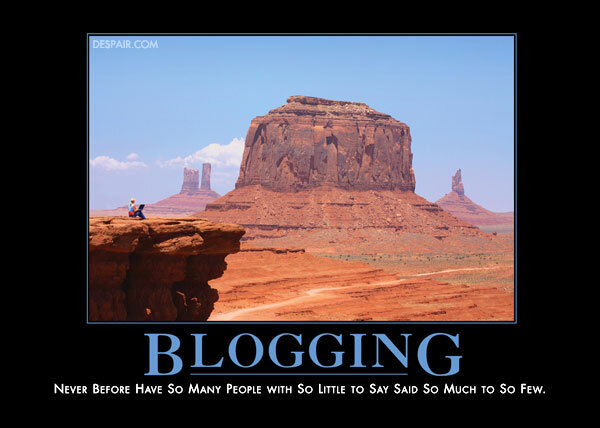 Blogging and Discernment, by Adrian Warnock – good indictment on blogging and interesting points about discernment. This is a key question that has a very practical impact on one’s approach to discernment: does discernment seek primarily to defend truth from error or primarily to promote truth thus exposing error. Which should have precedence the positive or negative approach? Blogging is a tricky medium because it gives the impression that it is a well reasoned piece of credible information similar to a online column. Yet, very often it is the ranting and raving of those completely unqualified to be discussing the subject, much less helping to form others opinions. It is Dr. Myron’s opinion that it is an “illegitimate medium.” I wouldn’t go that far necessarily but I can really understand his sentiment. It is very difficult to communicate anything of worth on a regular basis. It is for this reason I want to offer this caveat to remind myself and anyone who should read that I consider much of what is written and said here to be not much more than casual conversation and it should not be viewed with more authority than that. As far as credentials are concerned. I am in the midst of a Masters of Divinity degree and make it my constant hobby to read and learn. Yet, in many ways I’m still growing in the maturity and spiritual wisdom it takes to really offer a healthy perspective. I hope the other members of this blog who may be reading will continue offer accountability and confrontation to maintain a healthy level of discretion about what is said on this blog. Much thanks for your continued understanding and mutual encouragement.